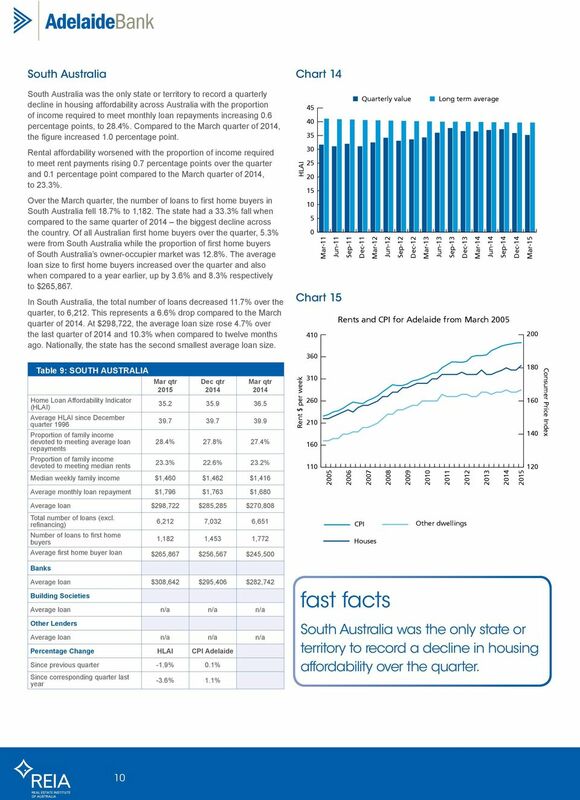 10 South Australia South Australia was the only state or territory to record a quarterly decline in housing affordability across Australia with the proportion of income required to meet monthly loan increasing.6 percentage points, to 28.4%. Compared to the March quarter of, the figure increased 1. percentage point. 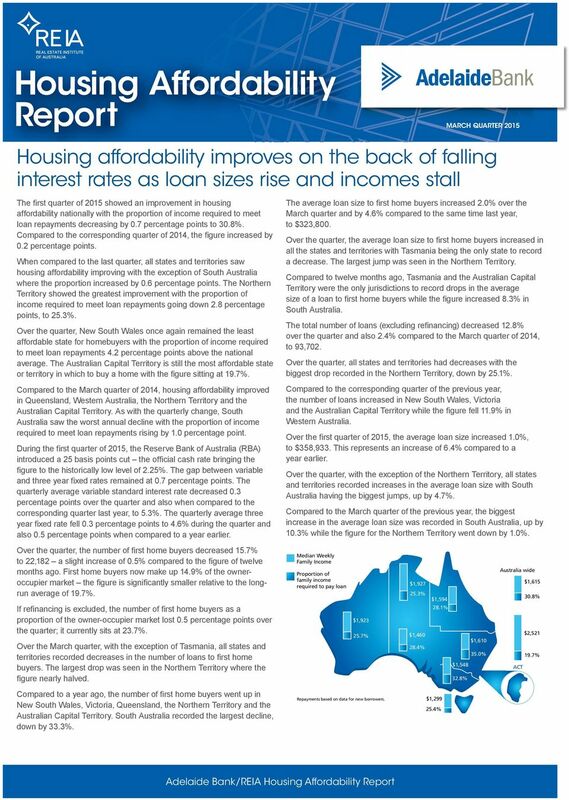 Rental affordability worsened with the proportion of income required to meet rent payments rising.7 percentage points over the quarter and.1 percentage point compared to the March quarter of, to 23.3%. 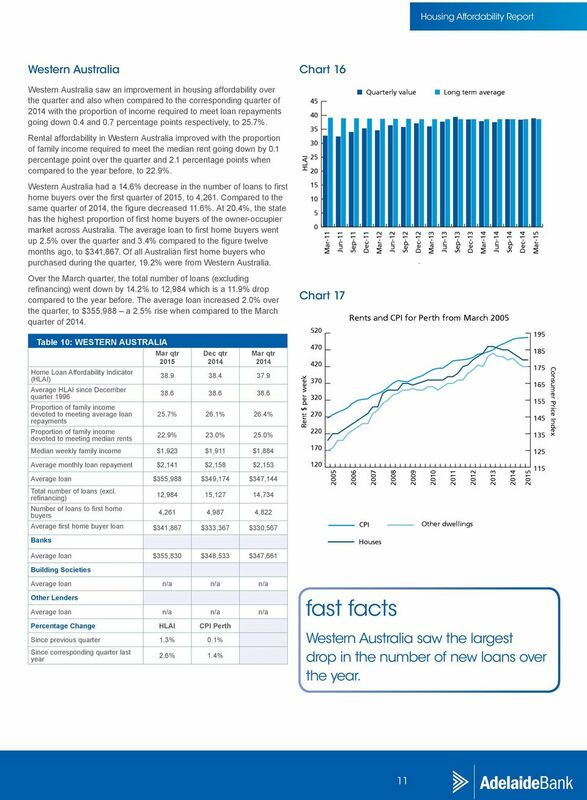 Over the March quarter, the number of loans to first home in South Australia fell 18.7% to 1,182. 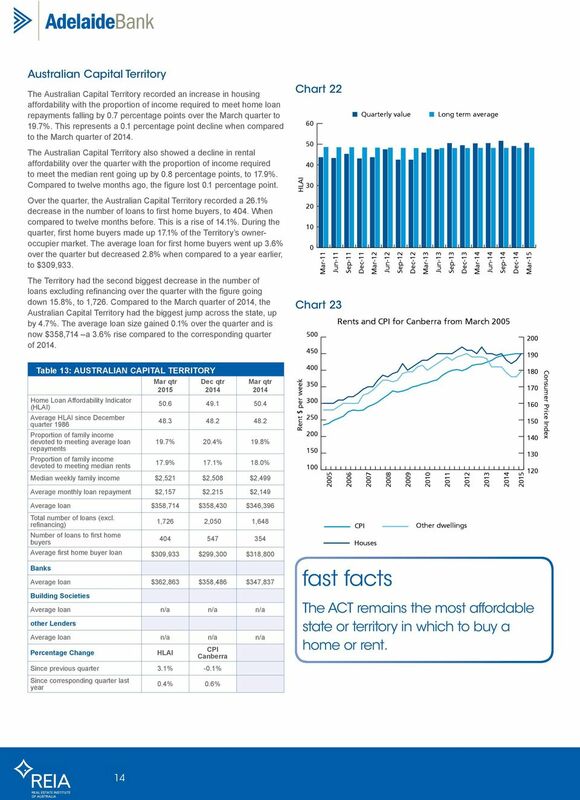 The state had a 33.3% fall when compared to the same quarter of the biggest decline across the country. 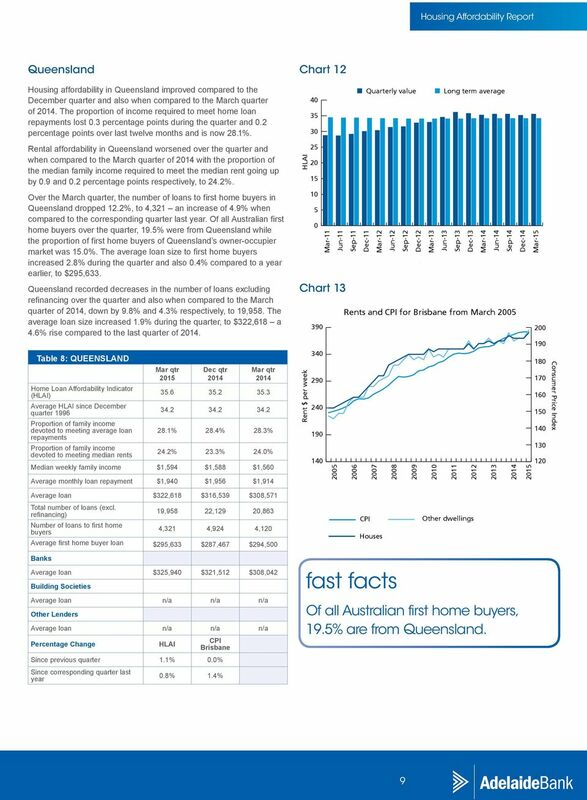 Of all Australian first home over the quarter, 5.3% were from South Australia while the proportion of first home of South Australia s owner-occupier market was 12.8%. 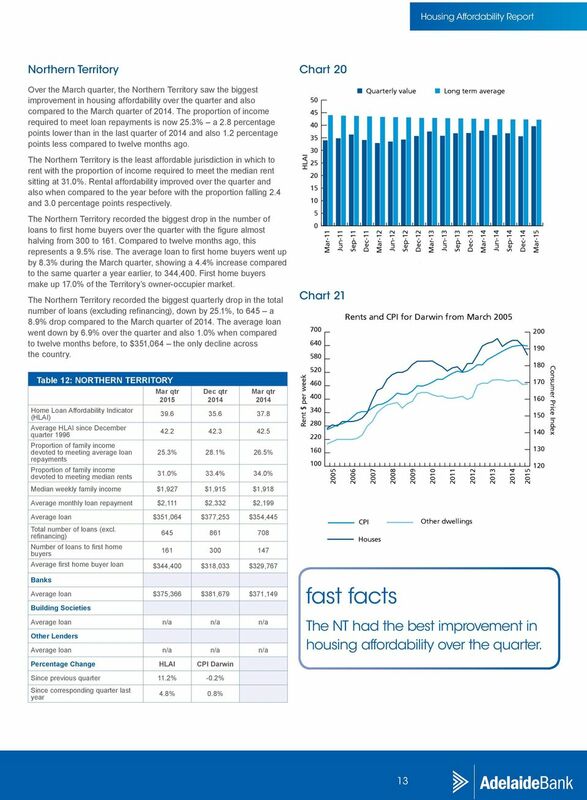 The average loan size to first home increased over the quarter and also when compared to a earlier, up by 3.6% and 8.3% respectively to $265,867. 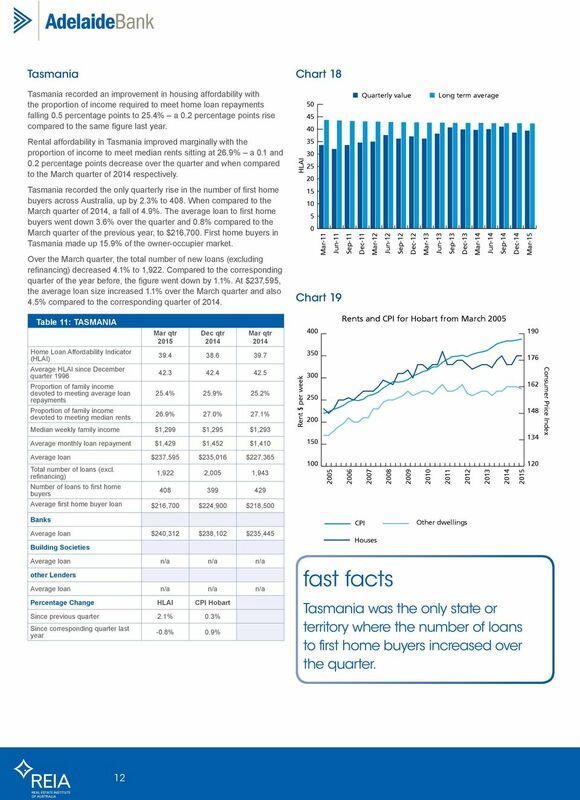 In South Australia, the total number of loans decreased 11.7% over the quarter, to 6,212. 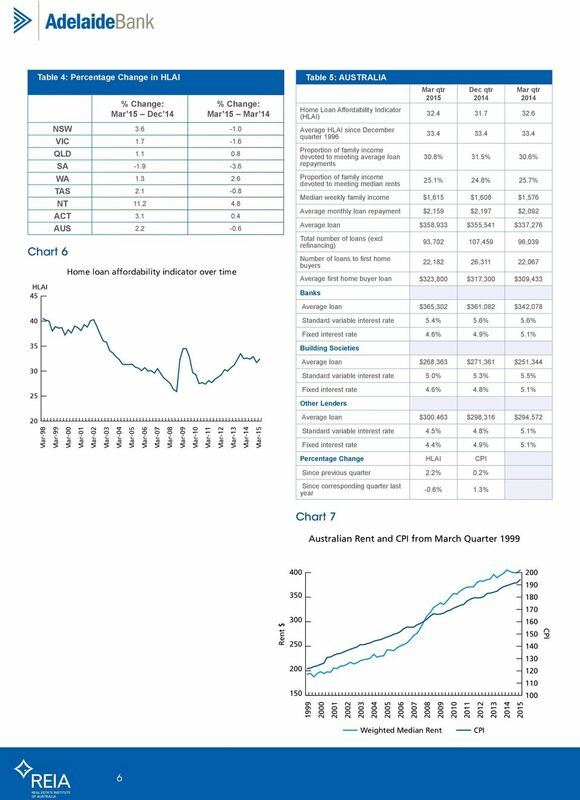 This represents a 6.6% drop compared to the March quarter of. At $298,722, the average loan size rose 4.7% over the last quarter of and.3% when compared to twelve months ago. 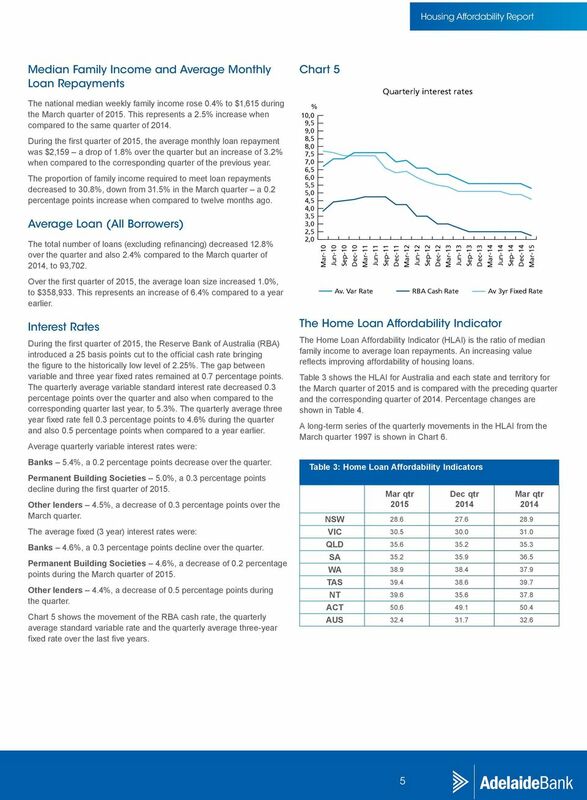 Nationally, the state has the second smallest average loan size. 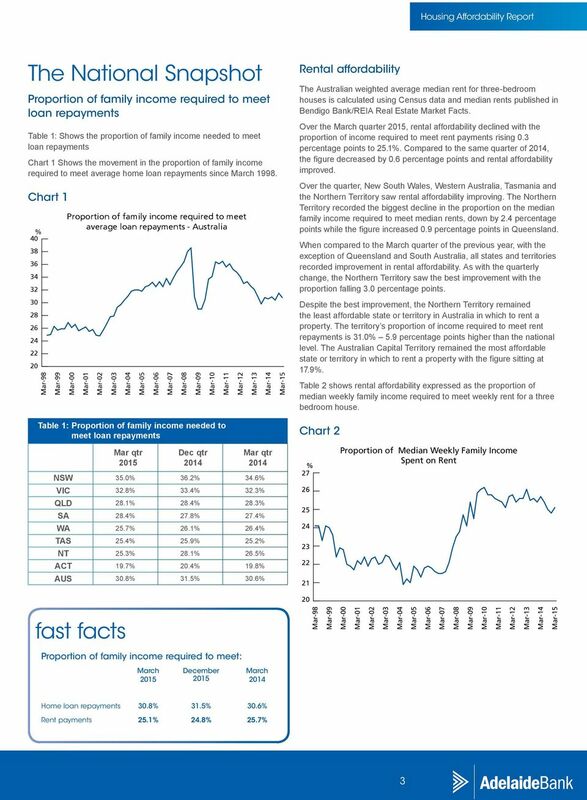 Table 9: SOUTH AUSTRALIA () Average since December quarter 1996 devoted to meeting average loan % 27.8% 27.4% 23.3% 22.6% 23.2% Median weekly family income $1,46 $1,462 $1,416 Average monthly loan repayment $1,796 $1,763 $1,68 Chart 14 Chart 15 Rent $ per week Quarterly value Long term average Quarter Rents and for Adelaide from March Consumer Price Index Average loan $298,722 $285,285 $27,88 Total number of loans (excl. 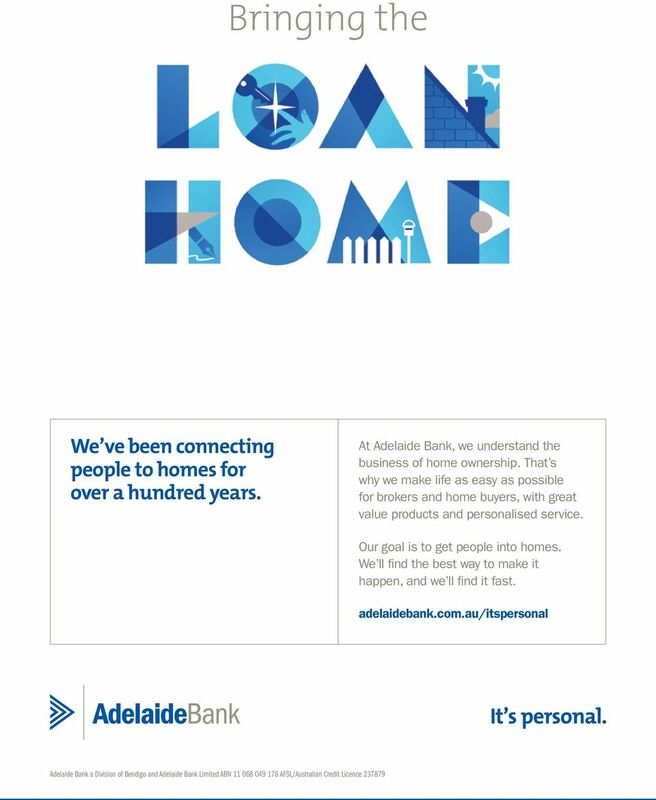 6,212 7,32 6,651 1,182 1,453 1,772 Average first home buyer loan $265,867 $6,567 $245,5 Average loan $8,642 $295,6 $282,742 Houses Other dwellings Other Lenders Percentage Change Adelaide Since previous quarter -1.9%.1% -3.6% 1.1% South Australia was the only state or territory to record a decline in housing affordability over the quarter. Welcome home to true value. 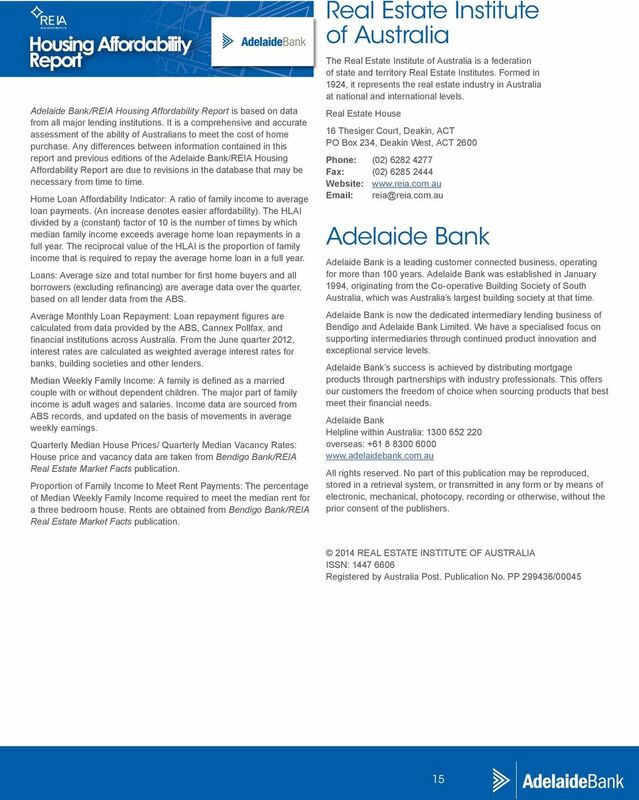 Commercial notes SECURITIES: ENSURING PAYMENT OF DEBTS TO THE COMMONWEALTH. 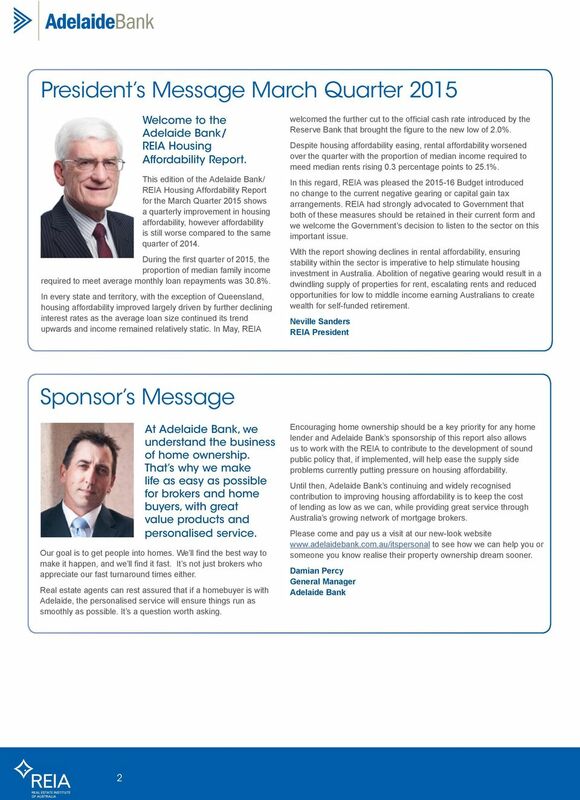 What types of property can be used as security? 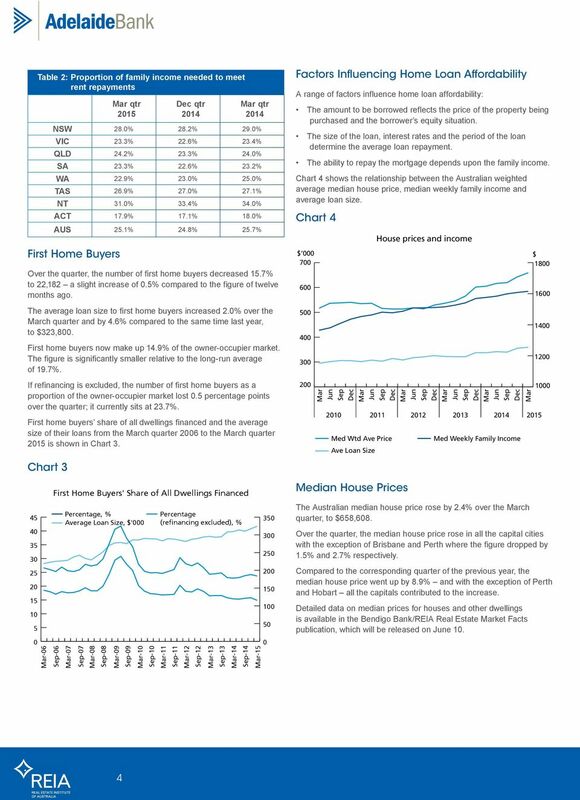 Where is it cheaper to buy than rent?